More than two-thirds of the military’s operationally critical installations are threatened by climate change, according to a new DoD report. The January 2019 report, “Report on Effects of a Changing Climate to the Department of Defense,” was submitted to Congress Thursday without an official announcement of the report or a public release. Several environmental organizations made the report publicly available early Friday. After several reporters questioned why the report was not made public by DoD, the Pentagon published it on Defense.gov mid-Friday. The Pentagon did not assess all of its hundreds of installations, instead it selected “79 mission assurance priority installations based on their operational role,” the Pentagon said in its report. In its assessment of those 79 installations, which included Army, Air Force and Navy installations — and notably no Marine Corps bases — the services reported that 53 of the 79 faced current threats from flooding; 43 of the 79 face current threats from drought and 36 of the 79 faced current threats from wildfires. The Pentagon also looked at logistics sites and other support that it considered operation critical, including Washington Headquarters Services, which includes the Office of the Secretary of Defense and supporting offices. the Defense Logistics Agency, the Defense Finance and Accounting Service and the National Geospatial-Intelligence Agency. Critics said the report not only fell short of Congress' direction but also questioned why not a single Marine Corps Base was included. The report also did not mention last year’s massive storm damage to military installations. 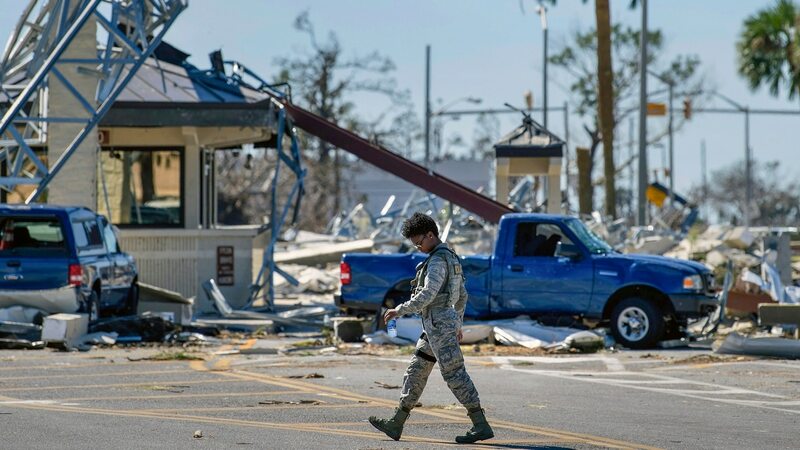 Tyndall Air Force Base sustained serious damage to almost all of its buildings by Hurricane Michael and the Marines' Camp Lejeune was badly damaged by Hurricane Florence. A base notice reported that 70 percent of the Lejeune-area homes had received some damage from the hurricane. Sen. Jack Reed, D-R.I., the ranking member on the Senate Armed Services Committee, had a few choice words for it. “The report reads like a introductory primer and carries about as much value as a phonebook,” Reed said in a statement. The NDAA language also required cost estimated to mitigate the risks at the bases, and a list of the top 10 most climate-vulnerable bases, which it did not, said John Conger, director of the Center on Climate Security. “It will be interesting to see how Congress views this sort of non-compliance of the law” with the report, Conger said. “The report highlights the climate vulnerabilities of the top 79 mission assurance priority installations. By using this alternative approach, we are able to highlight where there are operational risks,” Babb said. Conger previously served at the Pentagon as a deputy under secretary in the comptroller’s shop, and as the assistant secretary of defense for energy, installations and environment.